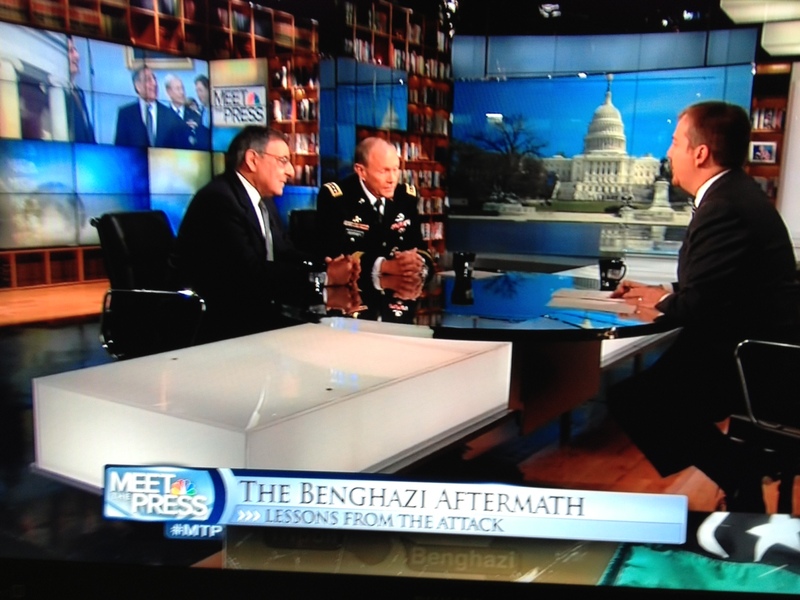 Today’s Meet the Press was hosted by NBC’s Chuck Todd, and his first guest was Secretary of Defense Leon Panetta. They started with the negative Republican reaction to Secretary of Defense nominee and former Senator Chuck Hagel (R-NE). Panetta gave his support to Hagel and said the GOP criticism was predictable. Also on the program was the Chairman of the Joint Chiefs of Staff General Martin Dempsey who wisely avoided giving a political opinion on Hagel. However, Dempsey said he’d had many very positive interactions with Hagel over the years. The two men discussed embassy security following the attacks on the Benghazi consulate and last week’s attack on the US Embassy in Ankara, Turkey. No new ground was covered. “In a world of responsible politics it should not happen,” Panetta said. Dempsey agreed. However, it is clear that preparations for sequester are underway. Dempsey confirmed that as many as 800,000 civilians may lose their jobs under sequester. In a discussion of North Africa, Panetta said the United States is glad that France took the actions they did in Mali. And he said the United States is working closely with France on this issue. On Iran, Panetta repeated his claim that Iran has not yet made a decision to pursue a nuclear weapon, but they are clearly pursuing the capability to enrich uranium. Both men confirmed that American forces, at some level, will remain in Afghanistan after military operations end there in 2014. Regarding the movie “Zero Dark Thirty,” where Leon Panetta was played by James Gandolfini, Panetta said they were able to put together the puzzle to find Osama bin Laden without information gained using enhanced interrogation methods. “We could’ve gotten bin Laden without that,” Panetta said. Panetta would not be pinned down on who he supports for president in 2016 between former Secretary of State Hillary Clinton and Vice President Joe Biden. He said nice things about both of them. When Dempsey was asked the same question, he said he’d rather answer a question about the Harbaugh brothers. Regarding immigration reform there seem to be a consensus that the political dynamics are coming together for both sides. The roundtable then moved on to gun control with a brief mention of the recently released picture of President Barack Obama shooting a rifle at Camp David last August. Overall, the universal background check issue seems to be splitting Republicans in Washington, DC.